Having National Geographic photo-grapher Paul Nicklen as chair of the jury, a giant prize pool of USD 300,000 (!) and 28,578 participating photographs taken by 2,949 photographers off 88 countries, there is no doubt about neither the effort nor the success of Por El Planeta’s first nature photo contest. Also it is an honor to let you know that my image, “Quizzical Cat”, was awarded a 1st place as a Category Winner of Animal Portraits in this contest. Por el Planeta’s jury comprises Paul Nicklen (chair of the jury, Canada); photographer Graciela Iturbide (Mexico); National Geographic photographer Brian Skerry (USA); National Geographic’s senior photo editor for natural history, Kathy Moran (USA); and photographer Sophie Stafford (UK). Cristina Mittermeier (Mexico) acts as technical secretary. Por el Planeta is the first international conservation photography competition were participation in the contest directly translates into resources to support conservation efforts. Por el Planeta is not just a photography contest, it’s a movement seeking to transform our relationship with the planet and its wildlife. The competition was born out of a desire to reaffirm narrative photography as a powerful tool that encourages nature conservation and generates an appreciation for biodiversity. Por el Planeta is organized by Televisa, with National Geographic as its media partner and with the support of Mexico’s Ministry of Tourism (Sectur) and National Council for Culture and Arts (Conaculta). Televisa is a Mexican multimedia mass media company, and the largest in Latin America. 2,000 years ago there were lions all over Africa, in South Europe and in most of Asia. The population counted 1 million animals. To day there are no lions in Europe and in the Middle East, and in Asia there are only 350 individuals left! And the world´s lion population is still decreasing dramatically – over the last 50 years with more than 90%. To day the number of lions is 25-30,000 individuals. They are split up in certain core areas, which about 20,000 of the African population is concentrated in Maasai Mara in Kenya, Serengeti and Selous/Ruaha in Tanzania, Okowango/Hwange in Botswana and Zimbabwe, and the Greater Limpopo in South Africa and Mozambiqe. I have been doing wildlife photography in East Africa for 20 years. To get new kind of images I use different methods. Technically it is demanding because there are a lot of considerations to be made to get it work, a lot of pitfalls, and with that – a lot of frustration. But when succeeding one get interesting and rare images. 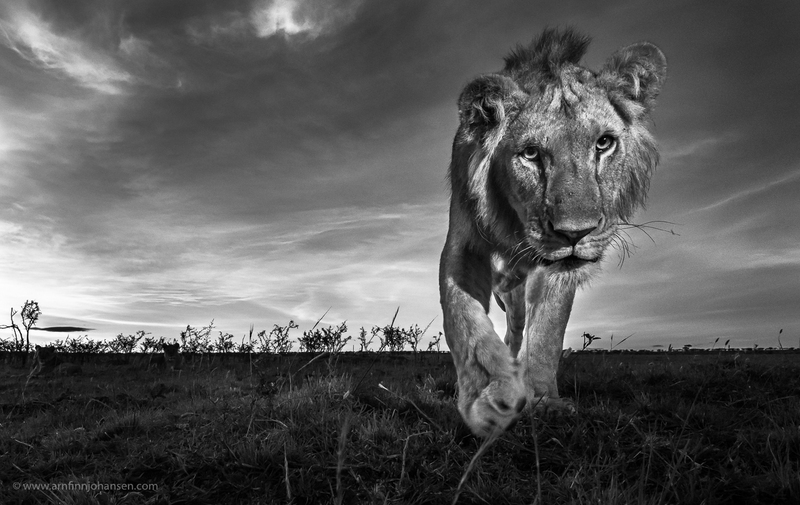 This wide angle lion image is taken in Maasai Mara, Kenya in November 2014, using a Nikon D4s and Nikkor 16-35/4 at 18mm placed in a sound-proof and biting-proof Aquatech Sound Blimp. The housing was mounted on a radio-controlled 4WD buggy. Based on previous experience I had modified the car body, regulator and electric motor to achieve optimal function with the possibility for extremely slow, soundless and accurate operating. All the essential camera functions, including aperture, shutter speed, ISO, mode as well as Live View and focus I control by an app on iPad Mini via CamRanger WiFi. For this image taken in the early morning, I used a Led Lenser torch as an extra source of light. The lions in Africa are facing many challenges, especially habitat loss, poaching and trophy hunting. My wish is that my lion images convey the majestic of this iconic top predator we are not allowed to loose. 1st place in Por El Planeta 2015. Nikon D4s, Nikkor 16-35/4 VR at 18mm, 1/160 sec at f/22. ISO 2500. Gratulerer igjen Arnfinn! Kjente igjen dette bildet, det skal jo godt gjøres å få det heftigere! great achievement – congratulations. This is a great award! What next? Gratulerer Arnfinn, ett magisk og heftig bilde. Som jeg vet det ligger mye arbeid bak.